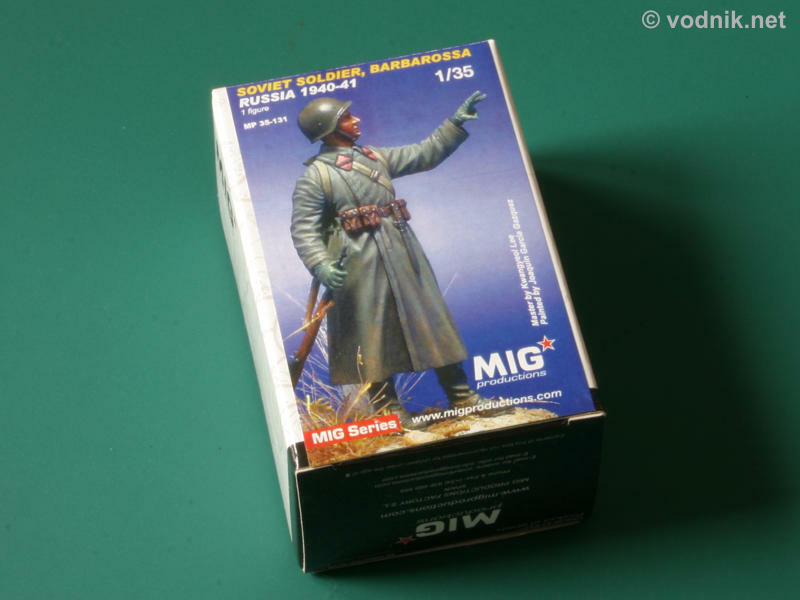 The resin Russian soldier figure is the first 1/35 scale full figure from MIG Productions company - at least there are no others in their current catalogue. 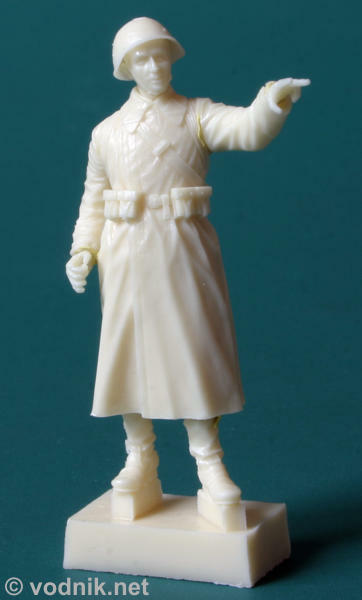 Among earlier releases are several 1/72 scale figure sets and also one set of 1/35 scale half-figure Russian tankers, but no other complete 1/35 figure. Reviewed figure portrays a Russian soldier during German Barbarossa campaign in 1940-41. 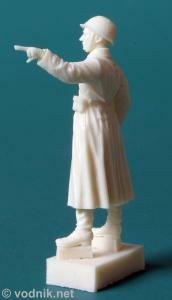 The master figure was sculpted by Kwangyeol Lee. The set comes in a small cardboard box and figure parts are packed in a single plastic zip-bag inside. To protect parts from damage a few styrofoam chips were added to the box and they did their job well, as everything in my set was in perfect condition. 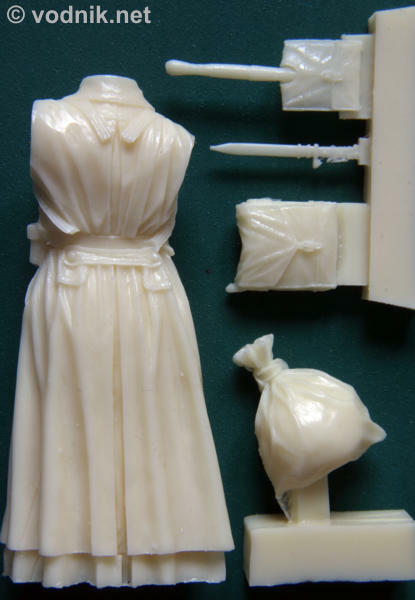 In the set we get 16 cream colored resin parts. The largest one is a figure body in heavy coat. To this we attach two feet / boots, two arms with separate gloved hands, a head with separate helmet and some other gear (backpack, shovel, bayonet, pouches and rifle). Molding quality is very high with just a couple of small air bubbles and almost no flash. Details are crisp and extremely well sculpted. The figure pose is relaxed and very natural. The soldier (finished figure on the box picture) seems to be discussing something with someone standing / sitting at higher level above ground - tank crew member maybe? Facial features are extremely well sculpted and single air bubble which scars the edge of the forehead under the helmet should be easy to fill. 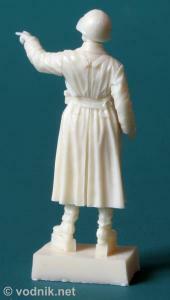 Also gloved hands are particularly finely sculpted and molded. Weapon and other gear details are all crisply molded and realistically reproduced. When I first started to examine parts in the set I was not able to name any of the soldier's equipment parts, as my knowledge of Russian WW2 weapons, uniforms and other gear is almost non-existent. But I spend a few minutes with Google and quickly identified most of things included in the set. 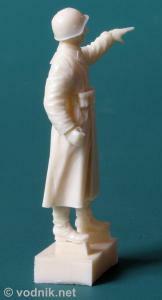 It was made very easy by the fact that all details on resin parts are extremely well and highly accurately reproduced. Rifle turned out to be nicely captured SVT-40 Tokarev and ammo pouches and bayonet are correct for this weapon and perfectly copied in scale. The helmet is SSch-40 with rivet details exactly where they should be. Heavy winter coat has all the features accurately sculpted and Vesh Myeshok backpack looks very realistic. Even the trenching shovel in a carrying bag looks exactly like full scale Russian WW2 item I found on photos on the Internet. I assembled the main figure parts using blue-tac type clay instead of glue to test the fit. No means are provided to establish a correct attachment position of boots under the coat, so modelers need to use their own judgment to attach them in realistically looking fashion. The way boots are molded on resin pouring block makes it a bit easier, as they are already set at correct distance and angle. 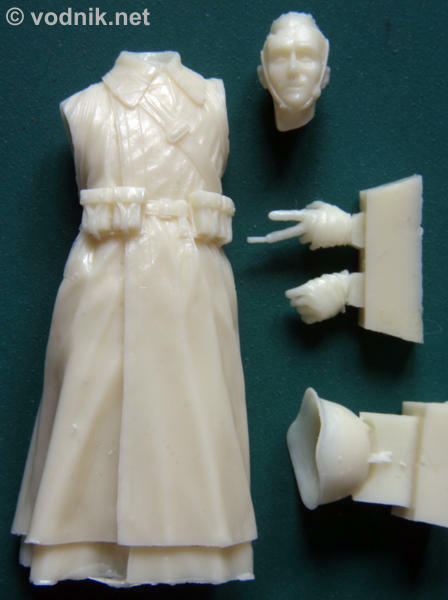 It is then possible to glue boots to the bottom side of main figure part before removing them from pouring block and saw it carefully off later. Head and arms fit very well to the torso without much trimming needed. The helmet sits at an angle on the head if attached without any modification of parts, but it should be very easy to correct by slightly sanding the head top or the inside of helmet part. Four views of assembled (temporarily, with blue-tac instead of glue and without any equipment) figure. Reviewed figure is really excellent. It is skillfully sculpted and very well molded. It includes many intricate and crisp details and they all seam to be very accurately recreated. Highly recommended!